Addressing the controversy surrounding political bias on American college campuses, the former President of Hampshire College presents a compelling argument against neutrality in higher education. Many conservatives argue the liberal bias of faculty in the United States is compromising the ability of universities to teach the art of critical thinking, which is so essential to challenging conventional wisdom and even challenging authority. They argue that the proper role of the liberal arts faculty and university is to maintain an institutional posture of neutrality in the face of major intellectual and social issues and, having laid out the main arguments about an issue, leave it up to the students to make up their own minds. If these advocates of "neutralism"-in and of itself a non-neutral position-succeed in transforming universities into neutral institutions, they will undermine the critical thinking they seek to support. They will damage the very character of US education that the rest of the world so admires and increasingly attempts to emulate-its capacity to encourage creativity and risk taking and to produce students who have the courage to challenge authority and convention in appropriate and constructive ways... To silence the university is to silence the citizenry. Our country and the world require from educational institutions commitment, engagement, and action, not neutrality. 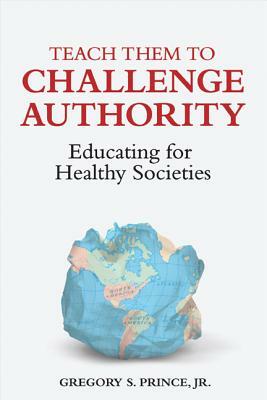 Teach Them to Challenge Authority gets to the heart of what education should really be about. Drawing on decades of experience, Gregory S. Prince Jr. moves seamlessly between his experience as President of Hampshire college and the broader, bigger picture made up of national and international issues. He demonstrates that the debate between those who favor "neutral" universities and those who favor "engaged" ones could have radical consequences-not just for the world of education, but for society as a whole. Gregory S. Prince Jr has just retired as President of Hampshire College.